When visiting the Gestalt IT Tech Field Day in Boston, half the delegates in the bus had already bought an iPad and after seeing what a great device it was, I couldn’t resist and on the last day I bought one myself. I did get some free playtime in the bus with the iPad from David Davis before I could hold my own and he had the Wyse PocketCloud for iPad application on it. I gave it a try and was really impressed. As I said, the first time I tried was in the bus at Tech Field Day. 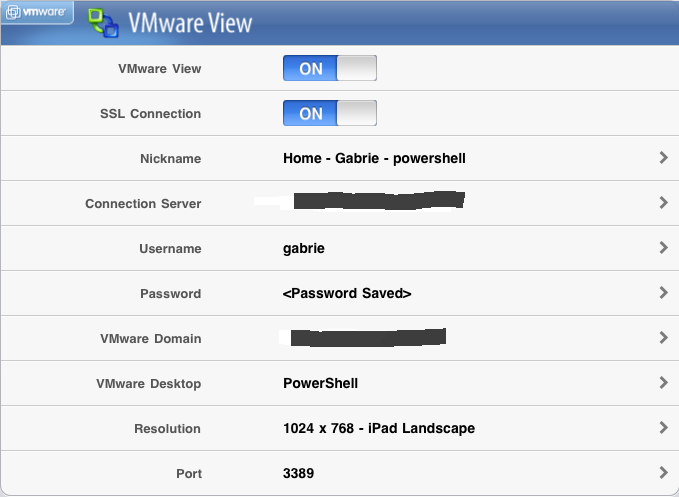 I used the Wyse PocketCloud app to connect to my home VMware View environment and I was quite impressed by the performance, considering it was a WiFi connection from iPad to a MiFi device, which routed the traffic over 3G to the internet all the way to the other side of the world to Belgium while driving. When I finally got my iPad and had tried some free RDP iPad apps, I decide to buy the Wyse PocketCloud app, although certainly not cheap at $14.99, it is worth the price. Let’s have a walk through the app. After starting the app, the first thing to do is create a connection. 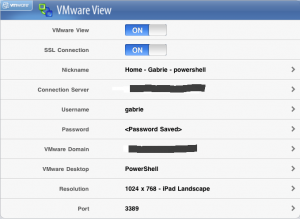 You can choose to connect to a VMware View environment or not. Choosing “Off” on the first slider will make this a RDP connection. You fill out the obvious connection details and then you can choose one of the desktop pools that View offers you. In my case I can choose between 4 different desktop pools. Next step is to select the screen resolution you want to work with. A very nice option is that you can choose between landscape and portrait mode for the iPad. However, once in a session switching your iPad between portrait and landscape mode doesn’t always work the way you want it. Sometimes a part of the screen justÂ disappears when switching back and forth. Two very good features when connected are the tools bar and the special mouse pointer they developed. With the toolbar you have quick access to a special keyboard, screen capture feature and special right click feature. The mouse pointer has changed into something that looks like a magnifying glass you normally put on a map. 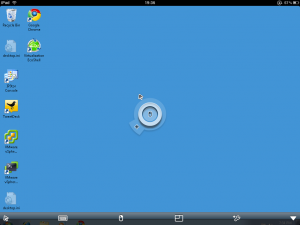 It makes it very easy to navigate and point the mouse pointer directly at a small portion of the screen. The mouse pointer also has some extra features like pressing it down for a few seconds to drag and drop or make vertical scrolling and combo keys very easy. 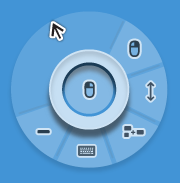 Personally I found the mouse pointer to be very handy and make a big difference when navigating. The only problem I had with it was trying to hit the Windows Start button. Even though it is very handy, it does take some time to get used to the extra functions before you use them fluently. Conclusion: If you have an iPad and want to sometimes quickly access some applications offered to you through RDP or VMware View, then Wyse PocketCloud is the way to go. Why did I use the word “sometimes”? Well, despite the fact that this app is great and the iPad is a great device, it is not a device you will be working on all day like you do with a laptop or desktop pc, but is ideal when you quickly have to read a document someone e-mailed you, do a review of a document and write little comments, but just not for working all day on it. Which is fine, every device has its place. Edit: As Joe Kelly pointed out in the comments section, I forgot to mention there also is a “Wyse PocketCloud Windows Companion“. When you install this into the desktop you’re accessing remotely, you can use the server-side browser capability, enabling full access to Web sites with Flash content. I haven’t been able to try this yet. 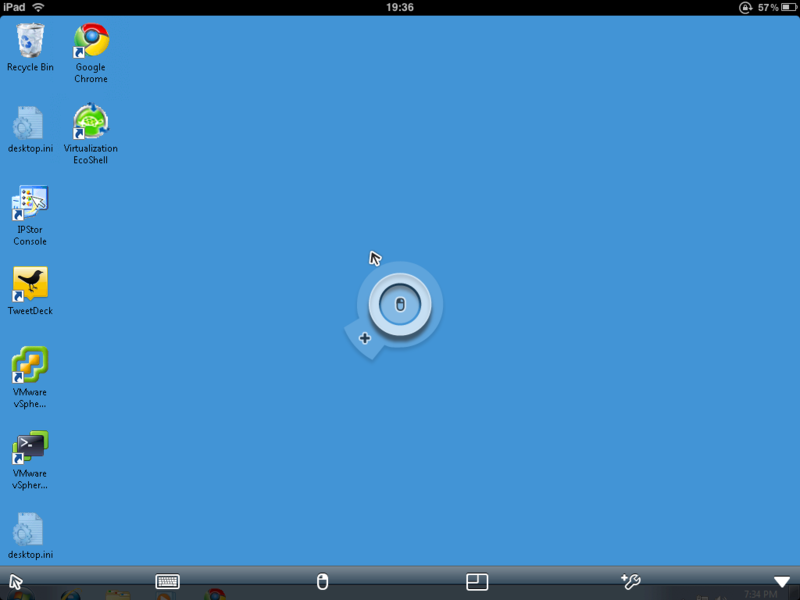 VDI, VMware apple, ipad, itunes, pocket cloud, pocketcloud, VDI, view, VMware, vmware view, wyse. permalink.